and Walking Bear comes finally home. I am heartbroken to pass on the news that the Great Bear Foundation’s co-founder and President Emeritus, Dr. Charles Jonkel passed away in Missoula last night, April 12, 2016. It is an emotional time for us at the Great Bear Foundation as we say goodbye to Chuck, but at the same time, I am struck by the impact that Chuck had on so many lives–human, bear, and all living things he encountered and fought for. 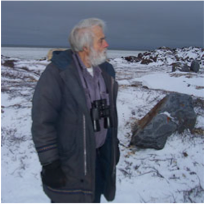 He leaves behind a legacy of bear biology, conservation, community involvement, social justice, and perhaps most of all, generosity and love. When I first met Chuck at the University of Montana in the late 90s, I had no idea he would change the course of my life. It is a privilege to carry on his work and legacy through the Great Bear Foundation. I’ve often tried to pin down the most important impact Chuck has made on me, and it’s very difficult. He taught me so much about bears, wildlife, and conservation, but the most important thing he taught me was how to live a good and righteous life, and that is something I will carry with me always. Chuck inspired, taught, and befriended so many people everywhere he went. He was not afraid to speak his heart and mind, and at times he could be an ornery old bear, but he made his imprint on all of us in the world of bear conservation. We will miss him terribly, but with a heart that generous and an impact that great, we’ll enjoy his legacy on into the future. Chuck shared that he hoped to be reincarnated as a polar bear. He had a den picked out on North Twin Island, lined with tundra flowers. When Hudson Bay breaks up this summer, there will surely be another polar bear coming ashore to find that den. Dr. Frank Tyro and I have been working for many years now on a documentary film on Chuck’s life and legacy. This preview was cut before Chuck’s death (an updated cut will air at the upcoming International Wildlife Film Festival awards ceremony April 22nd), but it pays tribute to his life and legacy. I hope that it will bring some solace to those who are feeling his loss. Click here to watch the preview. Click here to make a contribution to fund the archiving of Jonkel’s body of work..
Click here to make a contribution to the Jonkel documentary project..
Click here for the Montana Public Radio story.